Mouse anti Bovine CD1w2 antibody, clone CC14 (MCA831G) used for the evaluation of CD1w2 expression on bovine monocyte derived dendritic cells by flow cytometry. From: Pirson C, Jones GJ, Steinbach S, Besra GS, Vordermeier HM. 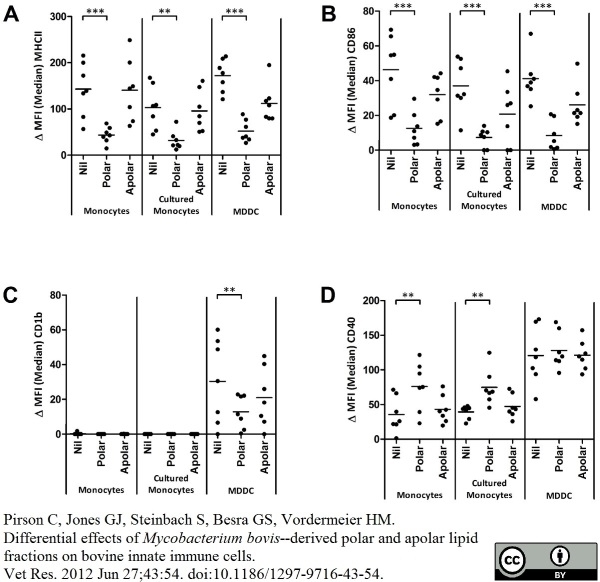 Differential effects of Mycobacterium bovis--derived polar and apolar lipid fractions on bovine innate immune cells. Vet Res. 2012 Jun 27;43:54. Mouse anti Bovine CD1w2 antibody, clone CC14 (MCA831G) used for the evaluation of CD1w2 expression on bovine myeloid cell subtypes by flow cytometry. Phenotypic profiles of bovine myeloid cell sub-populations. Live gated PBMC were assessed for expression of CD16 and CD14 and a panel of molecules associated with antigen presentation, co-stimulation or specific cell lineages (see Table 1) by 3 colour flow cytometry. PBMC were stained with primary mAb to the specific molecules indicated and then with an isotype-specific PE conjugated secondary, followed by CD16 and CD14 conjugated to FITC or Alexa Fluor 647 respectively. Live, single PBMC were gated based on the expression of CD16 and CD14 as detailed in Figures 1 and 2C. Histograms show the levels of expression of selected markers in the cell populations studied, CD14 − CD16 ++ (red), CD14 + CD16 + (blue) and CD14 + CD16 low/- (orange) compared to PBMC (black). Data shown are for one representative animal of four animals. From: Corripio-Miyar Y, Hope J, McInnes CJ, Wattegedera SR, Jensen K, Pang Y, Entrican G, Glass EJ. Phenotypic and functional analysis of monocyte populations in cattle peripheral blood identifies a subset with high endocytic and allogeneic T-cell stimulatory capacity. Vet Res. 2015 Sep 25;46(1):112. Mouse anti Bovine CD1w2 antibody, clone CC14 recognizes the CD1w2 cell surface antigen in bovine, sheep and goat. Mouse anti Bovine CD1w2 antibody, clone CC14 immunoprecipitates two protein bands of ~12 kDa and ~46 kDa. In immunohistology the reagent stains cortical thymocytes and a minority of medullary thymocytes, with a pattern similar to antibodies of the CD1b cluster in humans. Machugh, N.D. et al. (1988) Characterization of a bovine thymic differentiation antigen analogous to CD1 in the human. Scand J Immunol. 27 (5): 541-7. (1991) Comparison of reactivity of monoclonal antibodies on bovine, ovine and caprine tissues and on cells from other animal species. Vet Immunol Immunopathol. 27 (1-3): 32-4. Summers, C. et al. (2012) The distribution of immune cells in the lungs of classical and atypical ovine pulmonary adenocarcinoma. Vet Immunol Immunopathol. 146: 1-7. Brackenbury, L.S. et al. (2005) Identification of a cell population that produces alpha/beta interferon in vitro and in vivo in response to noncytopathic bovine viral diarrhea virus. J Gen Virol. 84: 1771-80. Jörundsson, E. et al. (2000) Distribution of MHC-II and CD1 molecules in the skin of lambs and changes during experimentally-induced contact hypersensitivity. Pirson, C. et al. (2012) Differential effects of Mycobacterium bovis - derived polar and apolar lipid fractions on bovine innate immune cells. Stephens, S.A. and Howard, C.J. (2002) Infection and transformation of dendritic cells from bovine afferent lymph by Theileria annulata. Valheim, M. et al. (2002) Lesions in subclinical paratuberculosis of goats are associated with persistent gut-associated lymphoid tissue. J Comp Pathol. 127: 194-202. Vet Res. 46 (1): 112. Corripio-miyar, Y. et al. (2017) 1,25-Dihydroxyvitamin D3 modulates the phenotype and function of Monocyte derived dendritic cells in cattle. BMC Vet Res. 13 (1): 390.